One of the most exciting (and frustrating, for someone who needs control as much as me) things about my life is I never know where I’m going. I often need to be ready to pack up and move at a moment’s notice, and owning very few things makes this okay, so long as wherever I’m headed, there’s gluten free food. Traveling is the only time I find it easy to talk to people, because they always wonder what ethnicity I am and where else I've been. It takes so long explaining that, they never realize I'm actually very boring and simply managed to collect a bunch of crazy experiences, in much the same manner as Forrest Gump. Best of all, no matter what city I visit, whether it's Shanghai or Tokyo or Istanbul or Muscat, I always find something that reminds me of Cleveland- like flying over Paris at night and seeing the city lights sparkle reminds me of catching fireflies as a kid. Unfortunately, flying is one of the biggest carbon sins, accounting for over 3/4 of my emissions. One round trip flight from Cleveland to Paris creates at least 3 tons of carbon dioxide for which I alone am responsible. Written like this, it really sinks in, like that time I found out Gossip Girl was a guy :( Apart from calculating my own impact and offsetting emissions, there are things I can do to minimize impact while traveling. Embrace e-tickets. Download tickets instead of printing them, and use electronic visas where possible. E-tickets are available for most attractions these days- at Versailles and Giverny, for instance. It's estimated one email emits 4 grams of CO2, whereas a letter-size sheet of paper emits 140 grams, embodied energy of smartphones and printers notwithstanding. Factoring in the fact that you can't compost airline tickets, e-tickets win. Carry on only. If you're water only and use baking soda as deodorant and rich bar soap for everything else, you can get away with not even using a plastic bag for liquids. That being said, I now travel with a Weck 080 mini mold jar of coconut oil (using the same size jar for baking soda) for oil pulling (it's also a great makeup remover, moisturizer, post-Brazilian treatment etc.). I take palm oil-free bar soap in a small linen drawstring bag and use a clear TSA approved zip bag from Muji that my mom gave me for liquids, which usually amounts to just coconut oil and hummus. Bonus points if your carry-on is secondhand- mine is secondhand Rimowa. Refill drinking utensils after security. Sometimes they won't refill your cup or canteen on the plane, especially on short domestic flights. On longer flights, I find that if they won't refill at your seat, they will at the back of the plane. It still comes from those giant water bottles, but at least you're sparing a plastic cup and unnecessary napkin. And yes, mason jars are allowed on airplanes. They'll even let you take glass or ceramic mugs. Refuse amenities. Bring a napkin (mine is actually an Ikea Elly towel), headphones, a big scarf to use as blanket, eye mask (I don't even have one as my eyes are already squinty enough), pillow (I just use a bunched up sweater, but there are organic fill ones), and socks (my grandpa's pure wool hand-me-downs. Swedish Stockings is an ethical option). I'm as tempted by Givenchy shaving kits and oversized Van Laack pajamas as the next person, but increased vulnerability to climate change is not worth looking like a luxe version of that scary clown from Big Comfy Couch. Pack food and utensils. Most airlines don't have provisions to opt out of food, and they stock more meals than there are passengers on the plane anyway. I usually fly airlines that don't do this, including Singapore Airlines, Qatar, Malaysian Airlines (the big Korean airlines aren’t allowed to waste food either), and low cost carriers like Wow. However, I haven't found an airline that provides vegan, gluten free, grain free foods yet, not even in first class! So, I always bring almonds, goji berries, apples, vegan peanut butter cups (I need them for writing), and dehydrated veggie chips purchased in bulk because they fill me up, fit nicely in light drawstring bags, and bypass security (you can even bring more hummus than is normally allowed as long as you put it on a salad or noodles or something). In the end, I don't have anything left to compost, since I eat apple cores and stems. Even if dietary restrictions don't force you to opt out of airline food, you can pack to reduce the need for packaged airport food. Carry a lightweight stainless steel tiffin for compostables (you can also shove them in a jar and drop them off at a restaurant or store that composts), and opt out of airline snacks by bringing some olives or carrot sticks. Be sure to empty your fridge before leaving. Bring your own pen. The one I use is Caran d'Ache because you can buy refills in Paris. Midori's brass ballpoint pen looks nice and classy, like something Joan Collins would use to sign checks while sipping martinis in Dynasty. Take public transport. Or walk everywhere. Sorry to be obvious but I needed to put this in here to make ten steps. We rented a car for our last few trips though. Don't forget reusables. A few foldable shopping bags; a little tiffin to take away berries, gluten-free baklava, kimchi, or vegan GF matcha cookies; and a mason jar should be all you need, lightweight enough to carry all day. Pack a menstrual cup and handkerchiefs, as always. Regarding razors- I saved my last plastic cartridge for travel, but I've just been taking my regular safety razor for years now. Nobody's said anything (I'd recommend carrying the blade separately, however, or checking it in). Same with my bamboo toothbrush and makeup brushes, although one commenter pointed out you can get stopped at customs for bringing wood into some countries. Just say no. If none of these steps are possible, simply refuse a plastic straw when eating out or ask for a reusable mug instead of a disposable cup. And order vegan instead :) A latte emits 340g of carbon because of milk, and if one more person tries to tell me almond milk is worse than dairy because it uses a lot of water, I will lose it. The emissions from a transatlantic flight is equal to, on average, two pounds of animal protein! Even if my vegan diet was all imported and primarily almond based, it would take up to 150 lbs of plant based protein to come close to the environmental impact of that. Do you make almond milk? Is having a high speed blender a must? I tried making almond and sesame seed milk but it came out tasting horrible. I used an emmersion blender, that's all I have. Thank you Ariana, I'll give it a try! A suggestion : I stopped buyin or making nut milks a while ago. I get almond butter from the bulk store and blend with water before use. Tasty and easy. That's such a good idea! Why didn't I think of that? A while back I read the diary of an English woman who lived in the early 1800s. Before she went on a trip she treated some fabric with bees wax to make herself a bag for her soap etc...I think people were zero waste then without even trying - how cool! I loved the diary excerpts because even though she was quite wealthy she was always repairing underwear and clothing to make it last longer, or taking her umbrella to the umbrella repair shop. I lol'd SO hard at your 'squinty enough' comment. I'm never caught without an eyemask (made from silk and filled with lavender) anymore after our experience travelling to the US. 10-12 hours direct flight from Sydney to LA overnight, stuck in front of the cabin TV projector (older plane) which meant no sleep and this horrendous bright light shining in your face. You'd think they would have switched it off for the overnighters but no. It was excruciating. Your eye mask sounds so luxe and relaxing :) Flights over the Pacific are the worst, I've never been to Sydney but flying from LA to Asia TAKES FOREVER it seems like the flight will never end and the cabin projector must have made things a thousand times worse so i don't blame you for being traumatized. I've been carrying my mini-toilette in a cloth bag for years now, through both US domestic and international flights. Nobody has said anything. I unzip it before putting it in the X-ray tray, so you can see in the top, and I haven't heard boo about it. Good idea! Yea I was doing that for a long time but sometimes people would just dump my little bag out into a plastic bag so my mom gave me the reusable clear one. Since then, no problems :) Glad it's working for you! Hi Ariana, I've a question about headphones: sorry for being such a newbie, but it's been a while since I traveled (but I am going soon so this post is precious) last time I took a flight, I really needed to use the plane headphone because the plug was different: two "things" on the plug and mine had only one. Can you plug a telephone or ipad headphone in the plane now ? Hi Pandore don't be sorry I thought the same thing- you can still plug it in even though there is only one, you won't get stereo sound but it will still work :) you can still hear from one earbud. A little off topic, but how do you get rid of used beauty products that your friends don't want? I have lots of samples and things I bought that irritated my skin or can't use up. I'd like to minimize, but don't know an ecofriendly way to downsize my collections. What country are you based in? Terracycle has a beauty product recycling program. If you are in the US, Mom's Organic Market accepts beauty products for recycling. hi ariana, i'm sorry if this question was answered already. what do you do if you are out and get some garbage or some wet garbage? do you bury it in a plant like bea johnson? how do you carry it around until you can find a plant or something outdoors? ps. i love hearing little bits about your life in cleveland. so cool that even though you live in paris you never forget your roots! Aw thank you so much Devon! Well now is a very good time to be from Cleveland :) And no matter where I live I'm still a Cleveland girl as cheesy as it sounds. Not everyone gets it but the place always stays with you and it shaped a lot of what I am today. Anyway now that that sentimental garbage is out of the way. No i don't bury it. I carry it in a stainless steel canteen or stick it in my mason jar or use my little reusable clear bag from Muji. If I don't have any of those things, I throw it out. Sometimes I have put it in a plant and gotten in trouble :) So now I don't anymore. I don't mess around in airports especially! It's not about perfection but being better so I don't feel guilty if I make a little trash. The Glee gum is nice because you can just swallow it. Thanks for the tips! I'm getting ready to head to Ireland from the States next week and trying to keep it pretty simple! One of the best things I have ever purchased is a menstrual cup, camping, hiking, trips, work are just SO much better. The amount of stuff I think I need on a trip has always been ridiculous, I pack at least three books even though I know I will buy more as I travel. I have actually left liquids behind in order to put mini bottles of liquor in my clear bag (I have been using the same one for six years now), a fact that always cracks up the one guy at the coop I shop at :o) And I am pretty sure I told you I donated a pair of shoes in Paris so I would have more room for books. As always I enjoy your unique and beautiful take on the world. 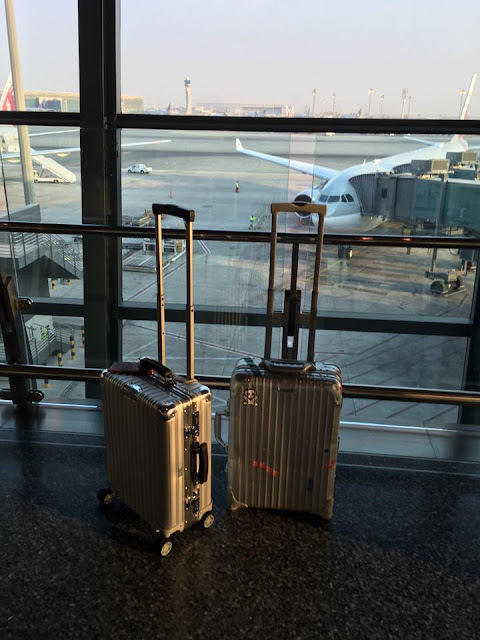 Do you have any issues with using your rimowa as a carry-on when flying? For example, Delta and American airlines restrict the width to 14 in, but the topas is 16 in. For the past two years, I've only traveled with a Longchamp bag. The last time I flew Qatar or Singapore airlines, I had no issue with the Rimowa, but now I only use the Rimowa when I'm moving overseas. Its a great pleasure reading your post.Its full of information Distance from Phoenix to San Diego I am looking for and I love to post a comment that "The content of your post is awesome" Great work.